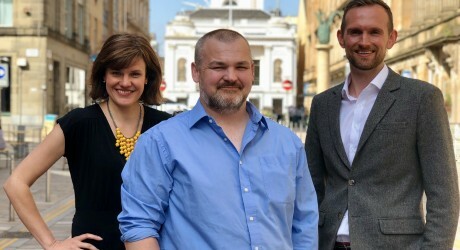 MEDIA Zoo, one of the UK’s leading communications companies, has launched a new creative hub in the heart of Glasgow. The award-winning agency has invested over £1m in a striking new office in Merchant City as it pushes ahead with ambitious growth plans across the UK. The Media Zoo group now employs 100 media professionals and clients include INEOS, RBS, Tesco, Marks & Spencer, IKEA and Schroders to name but a few. The agency is expecting to grow by 40 per cent during 2018 and plans to double its staff numbers in Scotland to meet the growing demand for its creative communications offer. Media Zoo Scotland plans to co-work some of its space and is looking to partner with other creative professionals and cutting-edge companies to create a real buzz in the city. Pic: Katie Clark (producer), Paul Crabb (director) and Neil McDonald (PR director) all of Media Zoo Scotland. Further photographs and logo’s can be provided upon request. MEDIA RELEASE issued by Media Zoo. You too can share your stories (aka press or media releases), on this site. Email here for more information.